This is a book that may be over-distributed (too many editions), over-quoted (I’m as guilty as anyone) and overpriced (in some versions), but it is seldom overrated. Although it has become fashionable among some to dismiss Mere Christianity as “dated,” Lewis’ book remains as important now as when it was published in 1942-44 and is eminently worth reading. If you have not read it, it is a must-read, and if you have read it, it is worth rereading. As Lewis himself said, “We have to be continually reminded of what we believe.” The book has its theological imperfections - Lewis was the first to admit he was not a theologian - yet despite that fact, this is a book from which every Christian can profit. 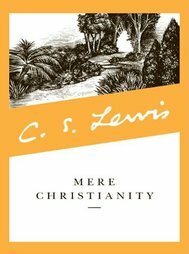 Material from Lewis’ three earlier books, mentioned in the blurb, form the three sections of Mere Christianity, but Lewis’ style is clear and connected enough that the three sections develop fairly seamlessly and with continuity. In the first section, Lewis cogently argues for the existence of God through a logical and clear analysis of the inherent feelings of right and wrong exhibited by individuals in all human cultures. This is no sloppy wishful thinking, and the Oxford/Cambridge professor’s discussion covers most of the anthropological, sociological and psychological objections that might come to mind, yet his writing is never pedantic or condescending. His arguments speak alike to those with or without advanced education. In this section Lewis also introduces the concept of Christianity and develops one of his most memorable analogies – that of the hall with many anterooms. This metaphor is surprisingly useful and one that both explains the present state of Christianity and helps us to explain it to others. In the second and third sections, Lewis continues by looking at what it means to be part of the Christian faith – how we become Christians and how we grow to the fulfillment of our purpose and potential. The various chapters contain dozens of penetrating and helpful insights on all aspects of the life of faith. Almost every page has its insights, and this is part of the great charm and value of the book – one can pick it up and begin reading almost anywhere and immediately grasp what the author is saying and profit from it. On the other hand, despite Lewis’ affirmed aim to stay “in the hall” and to explain Christianity as it is agreed upon by all Christians, he does occasionally introduce ideas which are his own views of a subject and with which readers may not agree. But these instances are relatively infrequent and regard, for the most part, theological matters on which there may not be any general agreement. Mere Christianity still stands as a masterwork of Christian writing. It is first and foremost an apologetic and fulfills that purpose admirably. As one recent reviewer wrote: “In the [seventy] years since it was published, the nature of the modernist challenge to Christianity has not substantially changed, nor has a clearer, more accessible response to that challenge yet been written.” On the other hand, Mere Christianity provides a kind of Christian road map – an explanation of what happens in this life to those who embrace the faith, what these things mean, and how we might successfully navigate the highway to our destination. The book is written with candor and compassion, with humor and with hope – and above all, with a totally ecumenical and embracing approach. Certainly the book is not perfect, but few books are as worth reading and rereading as this one.